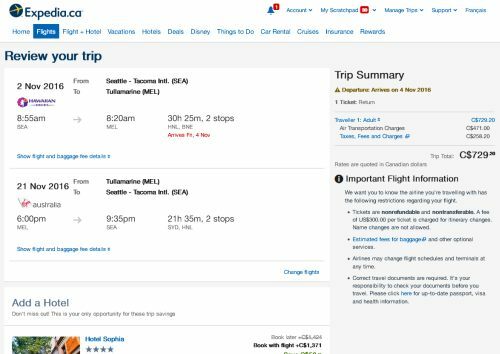 There are some unusually cheap flights showing up from Seattle to Australia, for as low as $729 CAD roundtrip including taxes. The flights are with Virgin Australia and Hawaiian Airlines. March, May, June, Oct, Nov, and up to mid Dec 2016. If you discover any other dates with low prices, help out your fellow traveler and post them in the comments section. Note: If the price jumps up on you on Expedia, you may also want to try on ITravel2000. They are showing these as well. Update: Availability seems to be coming and going this morning. It could be that the cheaper fares are put on a temporary hold when someone searches, and then released. Nov 16-30 wasn't working 5 minutes ago, but just tried again, and it showed up. 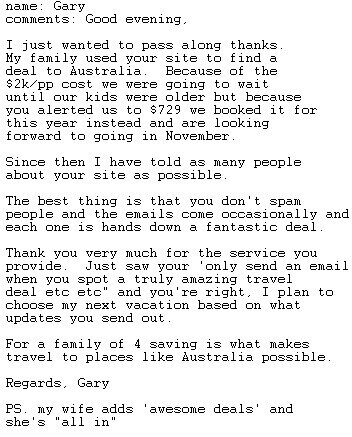 Currently having the best luck with seeing the remaining fares for Melbourne on ITravel2000.com or CheapoAir.ca and the remaining fares for Sydney on Expedia.ca. It could still be worth trying dates that I've declared as 'sold out' until this deal is officially dead. 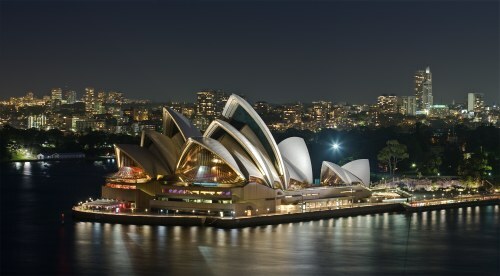 There are also a few ridiculously cheap fares from Vancouver to Sydney on very limited dates. But the travel time is very long, with lengthy stopovers in Los Angeles and Honolulu. May 2 or 3 to May 18 - Try this search on ITravel2000. seattle, sea, australia, sydney, syd, melbourne, mel, brisbane, bne, virgin atlantic, australasia and oceania and hawaiian airlines. 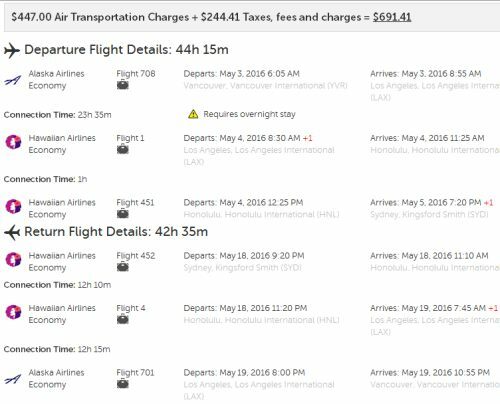 4 Responses to "Seattle to Australia - $729 CAD roundtrip including taxes"
The connection times seem pretty tight. 1.25hr in Honolulu on the way over. Do you think that is too tight? If I purchase the travel insurance will that cover me in the event the flight is delayed? 2 hours is usually the most ideal. 90 minutes is usually fine, just don't take your time. Since the flight is booked all on the same ticket, in the event your flight from Seattle was late getting in to Honolulu, and you missed the connecting flight, you would be put on the next flight out, at no charge. When this does happen, the extra half hour probably wouldn't have helped anyways. Virgin Australia and Hawaiian Airlines are partners. These are great deals but I don't see these prices on Expedia or iTravel200. I want to go for at lest 3-4 months too but it appears that these flights are only for 2-3 week trips. Is that correct or am I missing something? Carmen: When possible, I always try to mention that for longer trips, you can try mixing and matching the departure and return dates from the posted list of example dates. Flights from October to December for example, may have been possible to find at the same price. But this one has been out for a while now, so most dates might be sold out.